Your uterus is up at your belly button, so you might be getting some heartburn or indigestion. You might just need to burp a lot more often. Even if you don’t feel hungry, try to eat small, nutritious meals more often. If you haven’t already, it might be time to talk about your pregnancy with colleagues or your manager. This will help if your workplace needs to make arrangements to cover your maternity leave. Note that you can’t lose your job for being pregnant – there are laws against this in Australia. If you’re the first of your friends to become pregnant, some friends might not understand how you’re feeling. Many people find their friendship circle changes during pregnancy and after birth to include more people with children. You might find that some friendships naturally fall away, and that’s OK. 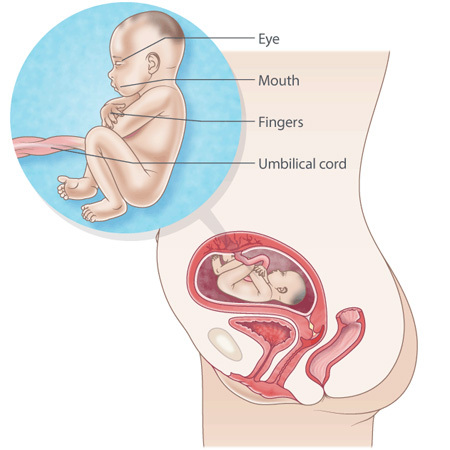 Your baby measures around 18 cm from head to bottom, and weighs about 390 gm. Your baby’s legs have grown and look more in proportion with your baby’s body. Your baby’s brain is growing, but its surface is still smooth.